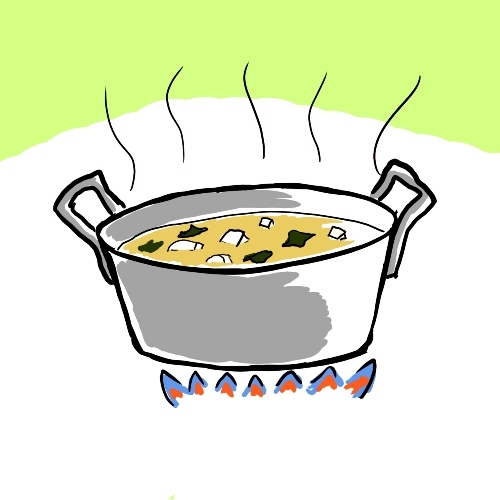 Heidi Nestler's son Ranmu Fukushima illustrated this image of miso soup for one of her upcoming Japanese cooking classes at the Urban Farm Center. Good miso soup starts with good dashi! We will cover making dashi, the broth that is the base for miso soup, as well as a key ingredient in all Japanese cooking. We will make three different types of dashi. We will experiment with different types of miso and learn how to choose ingredients to put into your soup. We will explore the savory and satisfying world of the traditional Japanese breakfast. Hint: miso soup is at the heart of it. Miso soup is great at breakfast, lunch and dinner. I’ll also show you how to make a clear soup which pairs well with sushi. Learn to incorporate mineral rich seaweed and kelp dishes into your everyday life. We will learn to make traditional dishes including salads, soups, savory side dishes and condiments to enjoy with rice. We will be using konbu, hijiki, nori, wakame, and more. We will also experiment with adding seaweed to more Western style foods. In upcoming months Heidi will teach all sorts of affordable cooking classes at the Urban Farm Center including a class on DIY natto, Japanese pickles, dairy ferments and more. I'm not sure which ones I'm going to go to yet but hopefully I'll see you at one. Sign up soon before they fill up!